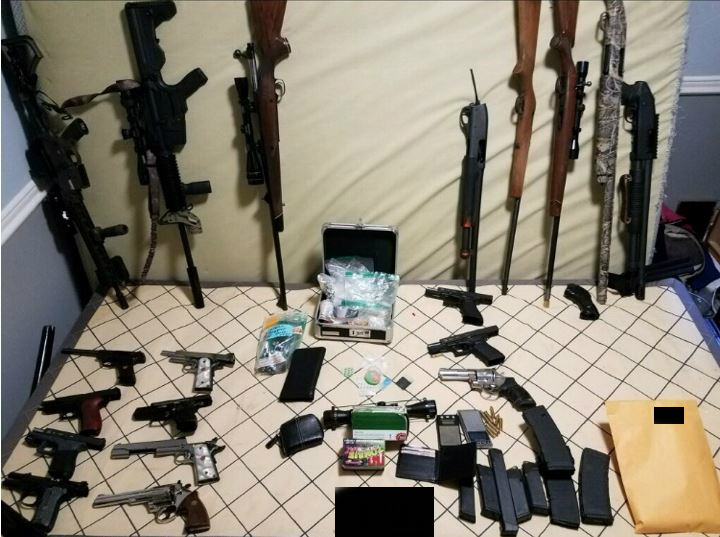 32 Replies to "CRIME WATCH FOLLOWUP UPDATE: Why Gregory Thompson is back in jail"
Any gun-rights folks out there want to tell me why it’s OK for someone to have all these weapons? It’s called the 2nd Amendment. This. And the best part? It’s never going away. The loveliest thing about the constitution? It’s that it can be changed. It has been changed in the past and it will change in the future. Exactly which part of well regulated militia was this scumbag representing? So we should abandon our rights because this scumbag law-breaker owns guns? We should not be able to form a militia because this guy owns guns and breaks the law? What part of him breaking the law isn’t a clue that he’ll own guns even if we outlaw them? Do you mean why it’s “OK” for a felon to possess one? Well, it’s not. Criminals don’t follow the law — ergo, we call them by that name. Free Will is a helluva thing, ain’t it? If you’ve never purchased a firearm and passed a background check, here’s the form for that. If you’re currently facing indictment, you are denied a purchase (in WA state, that accounts for every legal sale). If someone is to operate outside of the law, then how is it that we “Gun Rights People” are expected to answer for them? It’s interesting to me, that in Seattle, you have so many Social Justice Causes who would parade in traffic every week against what they perceive to be wide-scale discrimination (insert your favorite social media hashtag cause); but when it comes to anyone who owns a gun, to those same people, we’re all the same as the worst criminals imaginable, simply by exercising our rights. Curious, that “rationalization” for discrimination. With that said, the overwhelming number of illegal possessions are acquired via the “black market”, as it were. Criminals selling to other criminals (using their illegal money, funded by illegal drug sales, et cetera). It wouldn’t surprise me if half of the weapons in circulation have been used in prior crimes. The only way to stop that is by enforcement of the many laws already on the books. So, if you’re the sort to protest the hiring of more SPD officers, you are essentially fueling the growth of such illicit businesses. There’s no button you can push to vaporize someone’s guns when they decide to become a career criminal. And in the meantime, we’re still Americans, living in America, so — we law-abiding citizens get to continue purchasing as many firearms as we see fit, jumping through all of the pointless Gun Control Hoops set up for us by people who haven’t a clue. Perhaps – and I know this is a stretch – anti-gunners should consult gun owners in regards to what will or will not work? Before you push further ineffective gun control measures, please consider the fact that you are essentially only making it more expensive and unfortunate for your law-abiding neighbors (who, statistically-speaking, likely own guns). Yes, you have very likely been sleeping within 100m of a firearm, and not once did it get up in the middle of the night to do you harm. Nobody is forcing you to own a gun if you dislike them (or think that you dislike them; I’ve never had an anti-gunner not have a good time after taking them to the range). We just ask that you leave us alone and stop blaming us for the actions of bad people. Apply what you’re doing to gun owners (asking any of us to speak for all, as if we’re somehow accountable) to any other social group, and ask yourself if that sounds at all strange. Also, it is not uncommon for your average gun owner to own several firearms for several purposes. And they don’t owe you any sort of explanation, as it is their right to do so. So let’s stop circulating weapons. Thank you Jon, I dont think it could be put any more clear than that. I think it is ok for someone, yourself included, to have as many or as few guns as they please, within the law. This guy is operating outside the law and I’m all for him forfeiting the weapons (and more). If this guy lived down the street from you wouldn’t you like to have the opportunity to arm yourself, even if you choose not to? Chances are there is someone just like him living nearby that you don’t yet know about because they’re not quite as blatant in their activities. If he is removed, another will take his place, there are bad people in the world. He does live down the street from me and I stand ready should someone kick my door in. It’s painfully obvious where. He inherited a shabby eyesore of a house and knows just what he can get away with. Look for the automotive chop-shop in the front yard. The city can barely do anything because all the junkers are technically parked in the right-of-way, and he has no more than three in the driveway. Once in a while he gets cited for outdoor junk storage, inoperative boat, but that’s about it. Great job S.P.D. in observing and apprehending! You guys get half the credit you deserve. I hope the evidence and judicial system can work without a misfire. Jon, Jim P, well-written arguments. Just updated this story with info from SPD on where and how they found Thompson. Wow, easy one @thatsright. Because scum bags like this have guns (legal/illegally obtained) and I don’t want to be a victim or a statistic. When the 2nd amendment was written firearms consisted of muskets and the like. Not sure the authors had any inkling of the change in fire arms that has occurred in the last few hundred years. I’m glad Greg is back behind bars. And back when the 1st was written communications were written and transported by horse,train,ship, courier. Give up your internet and I phone and I’ll give up my guns. (NOT) I like the cherry picking. Some folks are so good at it I hope they’re at least spending some time in the orchards putting those skills to use. And while we’re discussing what should and shouldn’t be, breaking the law should be against the law. Wow, that was soo easy. Actually – there were semi-automatic rifles and even automatic rapid-fire guns when the 2nd Amendment was written. And if you read the Federalist Papers, it is very clear that the intention of the 2nd Amendment was to give the citizenry recourse against a corrupt government meant on suppressing its people. Which makes sense, since they’d just fought a bloody war for independence against said tyranny. Great points, Rick and Echo. It often frustrates me that people can’t figure this out on their own, and instead prefer to parrot back the old “muskets and bayonets” argument. Which makes sense, given they weren’t flippin’ idiots. Thank you WSB for keeping track of this case and a THANK YOU to SPD officers for getting this criminal off the street again – hopefully he’ll stay off for awhile. Does anyone else think it is wrong to not release mug shots of criminals such as this? How can we work to change the law regarding the lack of mug shots. I would like to know what this guy looks like, seems that there may be benefits to society to have an idea of who to lookout for when the inevitable release occurs. I agree Rico – I’d like to at least hear the rationale for not releasing them to the public. Well, same reason you don’t need a special police permit to buy as many cars as you want, even ones that can greatly exceed the speed limit. Our society does not operate on the “prove you should have this before we will allow you to have it” method favored by the more dictatorial nation states in which the government always knows best what you should have/read/do. Second: If this person is a convicted felon he cannot legally possess *any* firearms., Period. So it is rather unlikely he bothered with pesky details like buying them legitimately on the open market anyway. Guy in Toronto killed 10 or so people the other night with a rented vehicle while playing human pinball with their lives. But I’ll bet you don’t think you should have to have police permission to rent or own any kind of vehicle you want or declare schools “auto free zones” for kids’ safety even though many thousands of children are killed each year by cars. In the UK, assaults and murders via knives and acid attacks (and shootings in a very nearly “gun free” society) are at record heights. Criminals and violent mental health cases are the problem, not the specific weapons they choose or make. Consider prisons if you think disarming people and tight controls keeps things free of violence and risk of physical attack. By the usual logic used, they should be the safest and most peaceful places on the planet. Hmmm… this is a very specious bit of reasoning. I can’t drive a vehicle without a license. I can’t prescribe medicine, practice law, or install a side sewer without licensure/permitting, etc. Regarding arms, I can’t purchase or own surface to air missiles or any type of biological, chemical or nuclear weapon. In contrast to your statement, our society does regulate many activities/things, including many kinds of arms. The argument should be about what a reasonable regulatory regime for small arms looks like. I think one that makes it more difficult for a criminal like Greg Thompson to own a small arms arsenal is preferred to the status quo. You’re glossing over that driving is a privilege and owning guns is a right. And whether you believe in a Higher Power or not, those that wrote the Bill of Rights did and they believed that those first ten amendments put to paper endowed rights, not to be encroached by your government. They had the foresight and the benefit of having just gone through a bloody war for independence from a government intent on bending them to its will. You benefit from that, by the way, regardless of whether you choose to exercise your right or not. good lord can we just keep this guy off the streets? he’s clearly up to nothing good, apparently, ever. charge him and make him serve some real time. He is charged. That’s what the two FTA warrants are about, on cases in which he’s charged. We’ll see if anything additional is filed as a result of this. Love it when FTA’s are released. Hug and a hot beverage. Oh, and a promise. Thank you SPD for patrolling Westwood Village! !